BlackBerry Storm for $99 on Amazon | BlackBerry Blast! Looking for a BlackBerry Storm? Just about the best deal these days can be found at Amazon.com. 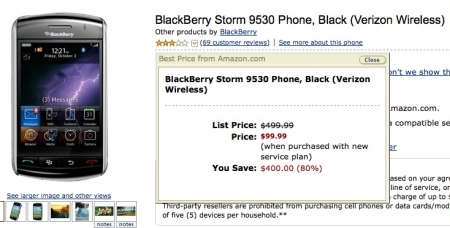 The BlackBerry Storm is going for a mere $99 at Amazon. Verizon is currently running the Buy One Get One Free sale, and now Amazon is offering a killer deal if you sign a 2-year agreement. If you're looking for a touch screen BlackBerry now is the time to pick one up.